If you love String Cheese Incident – then whatever you do, donʼt miss out on the upcoming event as it takes place at Red Rocks Amphitheater on Sunday 22nd July 2018! They are back on the road and that means of course they are stopping off at Red Rocks to give their Colorado fans a real treat this time. Thereʼs only one place to be, what are you waiting for?! Red Rocks Amphitheater is the perfect place to catch the legendary original group – grab your tickets while you still can and make it down for the big event!! SCI are an ultimate favorite at this venue and always go down well.. so to satisfy the needs of their fans they will be performing not one, not two but three whole nights in the height of Summer! 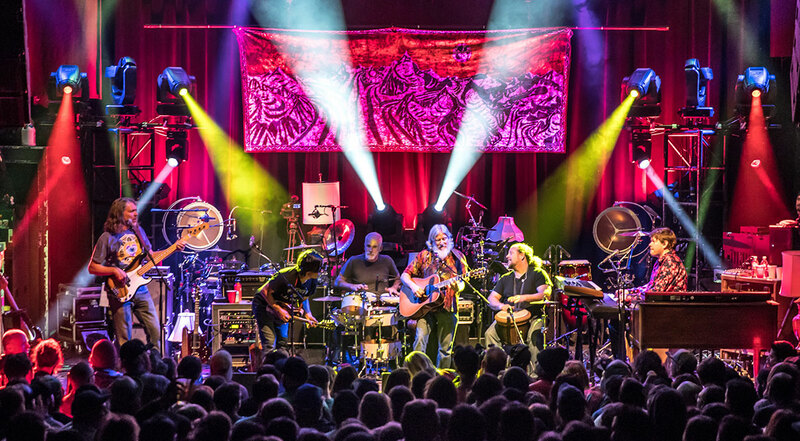 The American group, The String Cheese Incident are a local band from Crested Butte and Telluride, Colorado. With a career spanning over almost 25 years, the group are known for their sheer talent and dedication to music! Formed all the way back in 1993, SCI is Michael Kang (acoustic/electric mandolin, electric guitar, and violin), Michael Travis (drums and percussion), Bill Nershi (acoustic guitar, lap steel guitar, and electric slide guitar), Kyle Hollingsworth (piano, organ, Rhodes, and accordion), and Keith Moseley (bass guitar), and, in 2004, Jason Hann (auxiliary percussion). There's no one quite like them as SCI kick started their own career, performing where-ever they can at function shows and ski resorts to earn their cash, they then funded their own record label and begun to produce and release albums… the rest is history! These guys are known for the element of surprise through their music as they combine genre's, but every inch of their sound resembles SCI in all of it's glory and with every member of the band being behind their songwriting, you can really see why! What better way to get to see what they are all about then to catch them perform LIVE and there's no better venue to do so than at Red Rocks Amphitheater – soak up the beautiful surroundings while being blown away by high class music – Summer 2018 is shaping up to look pretty good!